An amazingly original, numbers matching car, still dressed in its original color combination of Cream and Suede Green, this roadster was owned by two prominent Jaguar collectors who cared greatly about preserving the originality of this car. This 120 SE is in running and driving condition, and includes a Jaguar Heritage Certificate verifying its authenticity. We have known about this car for some time, but it was never available for sale until now. 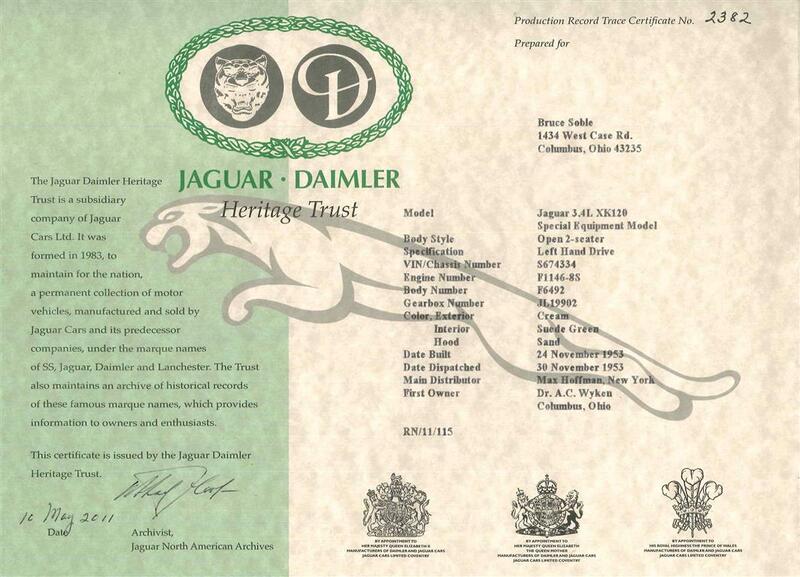 This is a wonderful opportunity to own a great car in Jaguar history. Built on November 24, 1953 it was dispatched from the Max Hoffman dealership of New York and sold to Dr. A.C. Wyken of Columbus, OH then sold to another collector in the same area, who took over caring for this special 120 SE until we purchased it from him just recently. 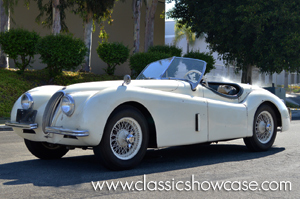 This XK-120 SE is only available for purchase as a Classic Showcase restoration done to that of a Show/Driver or Show level. Included in the restoration process the vehicle will be stripped to bare metal, placed on a rotisserie, metal finished, leaded, all body parts fitted to the car and chrome, prepared for primer, sealer, paint, base, clear, color sanded and buffed to a fabulous finish. The car will not be painted for a while, so we can paint it the color of your choice. All systems will be gone through and the engine will be rebuilt back to factory specifications. The fuel, electrical, cooling, and hydraulic systems will be restored. All components will be rebuilt back to factory specifications, including the engine, transmission, rear end and suspension. All chrome will be re-plated as needed. The car will receive a complete new custom tailored and fit interior in the correct materials by our upholstery department. A mp4 video of the restoration process will accompany the vehicle. Upon completion of the restoration this Jaguar will be a great example to drive, enjoy and compete in shows. In 1951 the ‘SE’ spec was introduced. Jaguar took what they had learned from their success with the XK120 and ‘C’-Type in racing and rallying and applied it to road going XKs. Power was increased from 160 bhp to 190 bhp and wire wheels added to provide better cooling for the drum brakes. The optional ‘C’-Type head upped the power output even further to an estimated 210 bhp. During the Second World War, William Lyons and his staff designed what would be the world’s first high-volume twin cam engine. After the war, a short wheelbase chassis and a two-seat sports body were married to this new engine and when the XK 120 was introduced at the 1948 Earl’s Court Motor Show. The XK 120’s body was a fresh, minimalist design with gracefully flowing curves running front to back, while the modern chassis design provided excellent handling. The XK inline six-cylinder engine, originally producing 160 horsepower, was mated with a four-speed manual transmission, and provided phenomenal performance. The XK 120 earned its name from when Jaguar was racing their cars. The car reached 120 mph!